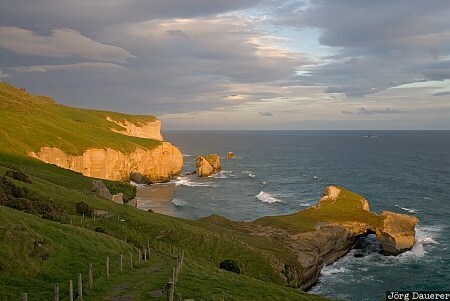 Clouds above the dramatic coast of the South Pacific Ocean at Tunnel Beach near Dunedin illuminated by warm evening light. Dunedin is in Otago on the south island of New Zealand. This photo was taken in the evening of a cloudy day in November of 2008. This photo was the image of the month in February of 2014. This photo was taken with a digital camera.